Beautiful silky ribbon will add a special touch to any wrapped box, gift bag, or specialty package. Single-Face Satin Ribbon has a silky feel on one side and a taffeta material on the reverse side. Double-Face Satin Ribbon will have a silky material on both sides. Stretch Satin ribbon offers a slight elasticity to your ribbon, great for wrapping packages or gifts. 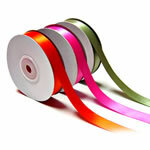 All types of Satin ribbon have a wide variety of colour and size choices.